The PD-140 is a power performer. Often referred to as the guard rail driver, the PD-140 is fully capable of driving posts that competitive systems simply cannot. No other system strikes the balance between investment and return as does the PD-140. 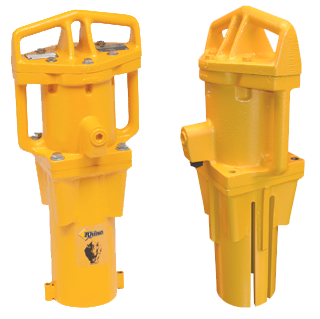 Thanks to the 4" piston and 139lb ductile iron casting body, the PD-140 is ideally suited to drive guard rail posts, heavy line posts, corner posts, gate posts, baseball backstops, dock piles, pin piles, foundation piles, wood posts, concrete posts, heavy gauge aluminum posts, well points, well casing and fence posts from 2" to 4" in diameter. Full Kit Ready to Go. Transport your Driver, Chucks and Accessories. Choice of 2 Chuck Adaptors. Full purpose transportable kit. Ready to tackle any job quickly. Choice of 2 Chuck Adaptors. 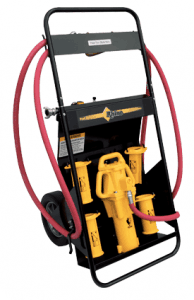 Full purpose transportable kit - when you already have a PD post driver. Choice of 2 Chuck Adaptors. Ductile iron casting, high in strength and ductility has 1" (25.4 mm) diameter handles and chain loop designed into the cover for easy handling and carrying. O-Ring sealed. Ductile iron casting, with excellent wear resistant characteristics. The air inlet is cast into the body and tapped with 3⁄4" NPT female threaded ports, along with 1" (25.4 mm) diameter side handles for easy handling. Chuck bolts pass through the lower body flange into tapped holes in the chuck mounting plate allowing special chucks to be made in a wide variety of shapes and sizes. 4" - Alloy steel heat treated with a ground surface with hard chrome plate. Designed with 2 round valve ports to give better lubrication and load distribution to the valve ring while running. The 4 1⁄4" (107.9 mm) I.D. master chuck is of an all welded, reinforced steel and tubing construction. The chuck is equipped with extra long chuck adapter attachment lugs. Standard chuck adapters are available in the following sizes: 2 1⁄2" ( 63.5 mm) I.D., 3" (76.2 mm) I.D., 3 5⁄8" (92 mm) I.D. and three channel post chuck adapters for 1.2 to 1.5 lbs/ft, 2 to 2.75 lbs/ft and 3 to 4 lbs/ft posts. 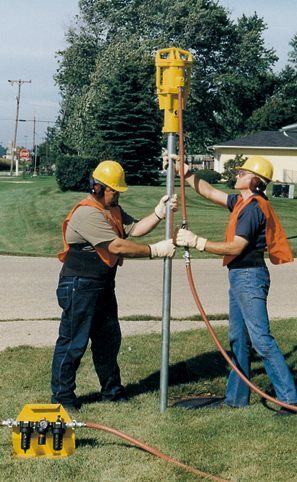 A chuck is available to drive 4" x 4" (101 mm x 101 mm) wood posts and a chuck and drive cap are available to drive 4" x 6" (101 mm x 152 mm) H column guard rail posts. 64 CFM (1.81 m3/min) @ 100 PSI (7 kg/cm2).